So the show was a success for me even though there was an exhaustion about me that kept everything slightly distracted from my attention. Just not 100% there, more like 96.5% perhaps. Nonetheless, my objectives were attained: enjoy checking out bikes, meet some people, and show off and explain my passion to my family. I think they left the show knowing more about bikes and bike culture than they were expecting, but they now understand, I think, that there’s more to bicycles than just recreation and repair. There’s an actual viable future with them; now they just need to get on bikes more themselves and then everything will gel! It was a wholly tiring weekend as I’ve mentioned, I could tell the exhibitors themselves were dogged at times too. I was a little disappointed in one booth in particular, not sure if my weariness was transferring to the guy there, but his friendliness was a little lackluster, but perhaps not everyone in the bike industry is a people person (shocking!) or more simply he was just as tired as I. He wasn’t nearly as disappointing however as the guy at the Shimano booth was though. It was a little off-putting when I asked why they didn’t opt for a platform pedal on the Di2 test bike to be told brusquely and dismissively that they wanted to present their new black Ultegra pedal. Not a soul was walking around that convention wearing road pedals with Shimano cleats on them; why not display the new pedals in a case or something? Didn’t make a whole lot of sense to me, but they’re the title sponsor so they know best I guess. Most people were friendly though, especially so on Friday compared to mob ruled Saturday. My talk with Lee at Highway 2 I’m sure will be well received by the guys I work with. Grilling Tone and Ed at the SRAM exhibit was illuminating, not really sure why the hell they didn’t have their new group Apex available there to view—I guess that’s why they weren’t the title sponsor, right? Chris Igleheart was a rad dude too. Meeting John at Sylvan was memorable, he was appreciative of my comparative of his frame’s tubes with pencils. The Yipsan booth were especially friendly and helpful in enlightening my sister and brother on bikes. Their town bike was one of our favorites, described as a “happy bike” it was no wonder it won the “Best City Bike” and the “People’s Choice” awards. These two booth’s bikes were some of my favorites; the Sylvan I think was a very unique approach to this alternative material—as he said, wood: the original composite. I like it. Other favorites included Engin especially for it’s paint being reminiscent of those old Singer’s and Herse’s. Another favorite bike was the blue town bike at Signal, his booth was especially rad too (love the T-Rex) and the overall layout’s classiness. On the whole I was pleased at having the accurate prediction that there’d be an abundance of cyclocross bikes and town/city bikes. Both are easily working to becoming my favorite styles of bike—I’m also already considering exchanging the CAAD9 road bike I’ve just gotten for something similar to my classic Italian steel. Richmond itself was a unexpectedly interesting town. From the Jerry Springer-esque brawl between two shoe-throwing ladies at some soul-food pizza shop we ate at (Leone’s Sportsbar?!) to the ceiling tile bashing party-goers at our hotel, there was a few classy gems thrown in between. One of which was the throw-back to the eighties family restaurant Byram’s where there was piano playing amongst the tasty greek faire. They had atmosphere in spades that really made you feel at home. We managed to find an outstanding alternative to the Comfort Inn’s coffee at Lift. But the best beyond that was the breakfast we had before our departure back to Louisville: Millie’s Diner, don’t let the word “diner” belie it’s true value to you. If within a hundred miles of Richmond, take the detour and get yourself the Ben Gurion lox bagel benedict. It won’t fail to impress. Fast and incredibly thoughtful/friendly/entertaining service was a great way to start a ten hour road trip. 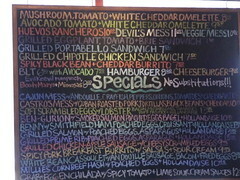 Millie's wall menu, bring your bi-focals. Good afternoon, good evening. . . I have no idea how we ran into Drew twice but didn’t see you there! I’m completely beat from the weekend. I think by the time you got there I was occupied with my family, but still, weird.